After an almost five-year journey to the solar system’s largest planet, NASA’s Juno spacecraft successfully entered Jupiter’s orbit during a 35-minute engine burn. Confirmation that the burn had completed was received on Earth at 8:53 pm. PDT (11:53 p.m. EDT) Monday, July 4, 2016. Secrets lie deep within Jupiter, shrouded in the solar system’s strongest magnetic field and most lethal radiation belts. On July 4, 2016, NASA’s Juno spacecraft plunged into uncharted territory, entering orbit around the gas giant and passing closer than any spacecraft before. 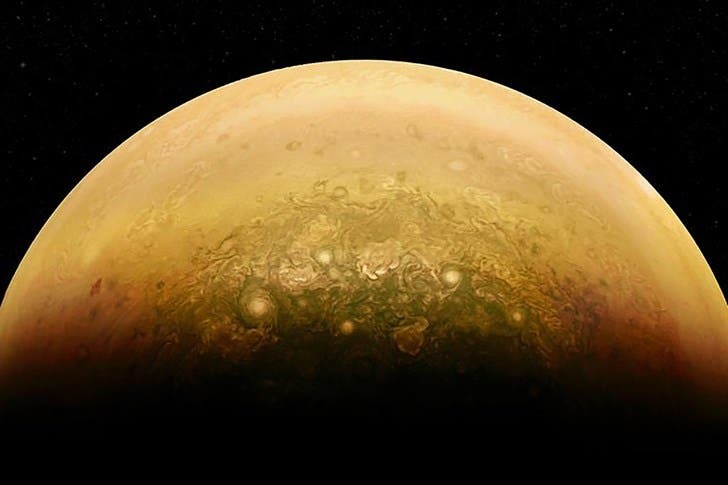 Scientists from NASA’s Juno mission to Jupiter discussed their first amazing science results in a media teleconference on May 25, 2017, at 2 p.m. ET (11 a.m. PT, 1800 UTC).